Maggie's Drawers is a term used in the Army on the rifle range when a soldier fires at the target and misses it completely. A large red flag waves across the target, back and forth, to alert the shooter, and everyone else within sight of the mishap. Soon the boo-birds are serenading the error, and a red face to match the flag. The term comes from an old song from the early 1940's: Those Old Red Flannel Drawers That Maggie Wore. I remember the way we sang it, "The Dirty, Dirty Drawers That Maggie Wore." No matter, we don't have a Maggie's Drawers in tennis, but both missing the ball completely and missing the intended target area of the court are not uncommon. It happens. Wouldn't that be something to have the baseline judge wave Maggie's Drawers for a foot fault? Or see the centerline person waving furiously that the serve missed service box. Or vendors peddling miniature red Maggie's Drawers pennants so that the fans can also join the taunt. Take my friend Ozzie, and, as comedian Henny Youngman would say, "Please!" What a crazy guy. Dr. Oz and The Wizard of Oz together couldn't straighten out my Oz, but we'll try. Picture this. He misses the service toss completely. 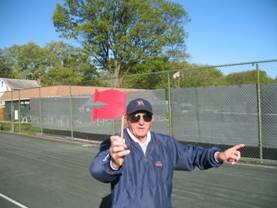 The baseline judge waves his red pennant. Then he double faults and the center lines person furiously waves his drawers. The chair umpire joins in, and soon the entire stadium is waving red flags at him? Colorful? You bet. Ozzie's face turns as red as Maggie's Drawers. Fortunately that will never happen. But why does Ozzie double fault? That's the important thing. The problem is with his toss, because it is not a toss. Ozzie tosses the ball so high you expect it to come down coated with ice. He misses the ball and grins. He's a funny guy! "Ozzie, why do you toss the ball so high? Just lift it gently up to the hitting zone" For years, I have been telling him, "Toss the ball lower, into the hitting zone." Oz replies, "The hitting zone. Where's that?" "The hitting zone," I tell him, "is where the racquet face is when you stand on your tip toes and reach up high as you can. That's the hitting zone! The ball is in the hitting zone 15 times longer than the ball from the high toss. Everything in the serve happens there. Flat serve, spin, kick, to the Tee, out wide. It all happens right there Oz. Try it." I prefer lifting no higher than the hitting zone because the ball is available so much longer. Vic Braden established this fact through one of the many film studies he made of strokes. In his video, "The Science and Myths of Tennis" he uses slow-motion photography to show the dramatic increase in the time a player has to hit the ball if the player serves using a low toss. With a low toss the ball is in the hitting zone on the way up, hesitates at the reversal point and on the way down, approximately 33.5 milliseconds. On a very high toss you can only hit the ball when it is descending, which gives you approximately 2.5 milliseconds to hit the ball. There are arguments and preferences as to whether the high or low toss is better. I hate that word, "toss," because it misguides so many students and players like my friend Ozzie. They think it is a toss and just flip the thing into the air. Actually the ball should come back down on your elevated hand. Alas, however, for convenience we must use that hateful word, "toss," although I wish we could toss it. Ozzie tries his serve with the lower toss. He misses the court, wide left. "Sorry Ma'am!" he responds to the searing glare from the adjacent court. He gives me that school teacher, over-the-eye-glasses look: "What!" "Your toe, Oz. It's pointing straight at the net. It's should point on a 45 degree angle, toward the end post." "What's the point," Oz quips, trying to be funny. He thinks he's a funny guy. "Okay. It allows the body to rotate toward the intended service box. Pointing straight ahead like you're doing now you over-rotate toward the wrong area. "Oz, the body's kinetic chain starts with the feet pushing off the ground sending that power up through the knees, torso, shoulders, elbow and wrist, each one adding to the power output at the contact point. If you pause along the way, it's gone." The toss (ugh!) and the broken kinetic chain are the two most common problems with the serve. The toe direction is the next. Since Ozzie shows noticeable improvement in the ensuing serving drill, we'll move on to another stroke; the forehand. This is more about missing the intended target area as well as missing the ball completely? Both happen in the recreational arena. Why? "Oz, do you know why your forehands are constantly going long?" "No, but you're going tell me." "I'll try anyway. First, you swing too hard. You don't have to flail at the ball. Your swing should approach the ball slowly, then accelerate through the hitting zone which is about two feet wide before the contact point. The first priority of any stroke is get it in. Power is the fifth. With the technology built into the racquets and strings today just the rhythm from your body will provide enough pace." "Okay. So I'll swing slower." "No Oz. Just start your swing slower, but accelerate it through the hitting zone." "Next, your follow-through goes up too soon. Instead of whipping through the follow-through, follow through to your target area. Hold it there with the racquet face still in the contact position. Your racquet will continue on up on its own. You don't need to help it." Ozzie winces: "What's the point? I already hit the ball. What difference does it make where the racquet goes after that?" "The point is, Ozzie, first the ball is on the racquet at the contact point just a few milliseconds. Whipping through the follow-through, as many instructors are wont to teach, shortens that time and tends to misdirect the ball. The difference can be likened to the difference between shooting with a pistol as opposed to using a rifle. The pistol, with its shorter barrel, is not as accurate as the rifle which has a longer contact with the missile hence gives a surer path. "When you follow through toward the target area your racquet is on the ball longer, essentially expanding the hitting zone and giving the ball more precise direction similar to the rifle example." "Is that all? ", quips Oz, trying to be funny. "There's more. Another important issue is with the accelerating and decelerating muscles in the arm. Approaching the ball the accelerating muscles are active to provide a smooth swing. After contact, the decelerating muscles act to slow the motion down smoothly. Whipping the follow through tends to short circuit this action and could possibly cause injury." "I get it! Accelerate positive, decelerate the negative, and don't hit the ball back to the screen." Ozzie's quick with the quips. I had to resist Molly's famous retort to the Fibber: "T'aint funny McGee!" "Finally Oz, don't peek at the target area. Everything happens at the contact point. Where to hit it; where the opponents are; all that is accomplished with Triple vision." "Triple vision, Oz, seeing the ball, knowing where you are on the court, and sensing where the opponents are. Triple vision." We'll take that up more along with other ground strokes at another outing. Ozzie's my friend. He's a funny guy alright, but tennis-wise, for now, sorry Oz, it's a Maggie's Drawers. If you wish to provide a comment to the author of this Wild Cards column, please use this form. Tennis Server will forward the comment to the author. This column is copyrighted by the author, all rights reserved.